Interior Space., Comfort., Handling and roadholding., Reliabilty., Great family car. No climate control., No USB., Didn't have alloy wheels as standard., MP3 port is a bit hard to get to. I own a 2014 model Ford Mondeo LX hatchback. I have found this to be a reliable and comfortable car for me and my family. 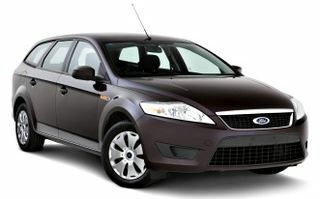 Other than regular servicing there has been nothing go wrong with the Mondeo. The 2.3 litre engine is fine for everyday driving, even thought I wish for a little more mumbo from time to time. It is a lovely highway car and sits safe and secure on the road. I average about 8.5 to 8.8 litres per 100 kms and find this quite acceptable for a car of this size. The interior room is one of it’s strong points. Plenty of room in front and back and with a load area big enough to have a party in there. I get more into my Mondeo than my mate can in his VZ Holden Commodore wagon. The seats sit well and have good bolstering and support for all my family. A lovely place to be when on a road trip! The interior appointments are quite acceptable for this type of car. I am 55 years old and come from a world of the simpler things in life. The Mondeo has a great stereo with MP3, parking sensors front and back, a lovely leather wheel and gear knob, Bluetooth, steering wheel controls and an easy to use air conditioning and interior. Climate control and a USB port would be handy sometimes but, I have no complaints. A comfortable place to sit and drive. I don’t need a lot of the modern day accessories that come available on cars these days. Everything that is needed for safe and comfortable motoring is right there for you! The servicing costs are quite okay and everything has run just fine. A slight gearbox whine now on start-up but, it goes away after about 2 kms when everything warms up. It has always been up to the task. I went looking for a Commodore wagon when I bought this and do not regret my choice. It has been an enjoyable car to own and drive and now that I have fitted alloy road wheels and Pirelli tyres, it is even better. A completely underrated car and would be a sensational 2nd hand buy for someone.